"What of Thorald? Is he nothing? So don't talk to me about suffering!" Fralia Gray-Mane is an elderly Nord pawnbroker living in Whiterun. She is the wife of the famous blacksmith Eorlund Gray-Mane, and the mother of Avulstein, Thorald, and Olfina. During the day she runs a stall at the Whiterun market, where she sells tools, weapons and other minor trinkets. Contrary to the claims of Olfrid and Idolaf Battle-Born, she believes that her missing son Thorald is still alive, and will pay you if you investigate this matter. She visits the Temple of Kynareth at 5am, staying there until 7am before returning to her house. While at home, she can be found eating, sleeping, or relaxing. At 8am she heads to the local marketplace to work at her stall until 6pm, when she goes home to do the cooking. Fralia wears a belted tunic, a pair of boots, and a hat. She is equipped with a Skyforge steel dagger, and carries a key to the clan's house, as well as a selection of common items and gold. When you greet her, sometimes she will praise her husband: "My Eorlund is the finest blacksmith in Skyrim, and that's not just a wife's boasting." She may badmouth the Battle-Borns instead, as she'll comment, "I can't stand those braggart Battle-Borns. They think they're the gods' gift to Whiterun." Depending on your progress in the quest Missing In Action, she will also talk about her missing son. Upon saying goodbye to her, she will tell you, "If you need any jewelry, just let me know." or "You take care of yourself, now." 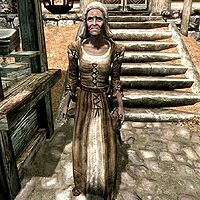 When she is operating her stall, she will promote her jewelry to passersby: "Bits and baubles for sale, all crafted by the best blacksmith in Skyrim." if she is not talking to you, "Come see my collection of Gray-Mane's finest trinkets! You'll not find their like in all Tamriel! ", or "Shiny trinkets for your good lady! All crafted by the great Eorlund Gray-Mane himself!" If asked, she will tell you about the best blacksmith of Skyrim. If Eorlund is alive, she will remark, "I can tell you're new around here, askin' a question like that." before explaining, "My husband Eorlund tends the Skyforge up at Jorrvaskr, the Companions mead hall. There's no finer smith in the nine holds. You should ask him about his work. It's the only subject that'll get him talking." She will add, "Well, that and maybe those stuck-up, dung-sniffing Battle-Borns." You can follow up with two more questions: mentioning the Battle-Borns will have her scoff, "Don't even get me started on that lot. They put on airs like they're somethin' special. Sure, they've got money, but they ain't got a shred of honor between 'em." She will end with "Gray-Mane. Now that's a name fills you with pride. We've got roots in Whiterun. We've got history." If you instead ask where Jorrvaskr is, she will respond, "Head up the steps from the market an' look to your right. Can't miss it." However, you will not hear her comment on the Battle-Born clan if Eorlund is dead, in which case she will tell you, "Curse you for bringing up that bitter memory. Not long ago it was my husband Eorlund. There was no finer smith in the nine holds. Now he's dead and gone and the Skyforge of Jorrvaskr lies cold." She will still give you directions to Jorrvaskr. 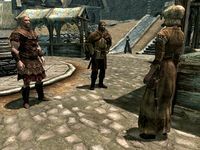 If the Stormcloaks are in charge of the city, Fralia can be heard commenting, "Never much cared for that Balgruuf myself. He was in the Empire's pocket, so to speak." When asked of her opinion, she will reply, "Pleased enough, I suppose. At least they appreciate the ways and traditions of the Nord people. Can't say I ever much liked the idea of the Empire telling us what to do an' how to do it." Olfrid: "Foolish old woman! You know nothing! Nothing of our struggles, our suffering!" Fralia: "Nothing? And what of my son? Hmm? What of Thorald? Is he nothing? So don't talk to me about suffering!" Idolaf: "Your son chose his side, and he chose poorly. And now he's gone. Such is the way of war. The sooner you accept his loss, the better." Fralia: "I will never accept his death! My son still lives. I feel it in my heart. So tell me, Battle-Borns, where is he? Where are you holding my Thorald?" Olfrid: "Do you believe this old hag? 'Holding him'? Why I've got him in my cellar. He's my prisoner. Face it, cow! Your stupid son is dead! He died a Stormcloak traitor. And you... you best keep your mouth shut before you suffer the same." Idolaf: "Come on, father. There's nothing more to be said here." After the confrontation, you may hear Olfrid and Idolaf's side of the story first. Olfrid will claim, "Just one more thing the Gray-Manes want to blame on others. It's not my fault they turned their backs on the Empire, or their mule of a son raised arms against it. And yet they want to heap the fault on my family's good name? Bah." Idolaf will likewise tell you, "More bad blood between the houses. Fralia is convinced our family is somehow at fault for the loss of her son. There's no reasoning with these people anymore." "It's not wise to discuss it here. Please, if you truly wish to help, meet me at my home. I'll tell you the whole story." "How can you be sure your son is alive?" "I just... I just know it. I can feel it in my heart. You have to believe me. Please, visit me at my home. I can tell you the whole story." Fralia: "Avulstein, put that down! He's/She's here to help us find Thorald!" Fralia: "I can't take any more of this. No weapons, please. Let's just talk." Avulstein: "We can't trust anyone! Who knows what they'll do if they find me here. How do we know he's/she's not spying for the Battle-Born? This was foolish!" You can ask Fralia more questions; for instance, she will fill you in on the situation: "Thorald's disappearance has been hard on all of us, but Avulstein has taken it badly. He's afraid of being taken as well, so he hasn't left the house. All he talks about is Thorald. Please, help Avulstein if you can. Something has to be done, or we're all going to lose our minds." On how she is so sure her son is still alive, she admits that it is hard to comprehend: "He's my son. I just... I feel it in my heart. You'd understand if you had children." As for why she thinks the Battle-Borns are involved, she has this to say: "It's hardly a secret that they have ties to the Empire, and hate anyone who speaks out against it. Thorald did worse. He took action against the Empire, and the Battle-Borns knew it." Now speak to Avulstein to hear what he wants: proof that Thorald is imprisoned somewhere. Once you have such proof, you can optionally show it to Fralia, who will be overjoyed: "I knew he wasn't gone, I just knew it! Please, get that to Avulstein right away." After delivering the proof to Avulstein, she can be found worrying about Thorald: "Please tell me you have news of my son." From the Imperial missive, you know Thorald is being held at Northwatch Keep. Rescue him from the clutches of the Thalmor. He will express his utmost gratitude for saving his life, but he still fears for his own safety. He plans to join the Stormcloaks as Whiterun is no longer safe for him and his brother. Before he departs, he has one last request for you: "But would you do me a favor? Tell my mother to suffer the winter's cold wind, for it bears aloft next summer's seeds. She'll know what it means." Now that Thorald is safe, bring the good news to an eager Fralia: "Is he? You've saved him?! I must see him at once!" Tell her that he didn't think it was safe to return, and she will be disheartened to hear it: "What? After all this, I can't even see him? How... How do I know you're telling me the truth, and not just what I want to hear?" Give her Thorald's message: "to suffer the winter's cold wind", which she will continue, "'...for it bears aloft next summer's seeds.' That's my boy." She will accept his fate, saying, "So it's true, then. For now, it's enough to know that he's alive. I can find peace in that. Thank you, dear friend. You've given me back my son." If Eorlund is alive, she will continue, "I'd had Eorlund forge this for Thorald. It was to be a present for his return. I suppose he can't have it now." and offer, "Why don't you take it? We can always make another for the day when this war ends and Thorald can come home." She will reward you with an enchanted weapon. If not, she will instead say, "With Eorlund gone, I'm afraid I can't offer you much in the way of thanks. But please, take this. It's the least I can do." and hand you some leveled gold. From now on, you can hear Fralia speak highly of her son: "Everyone thinks Thorald is dead. But not me. I know my boy is alive out there. Somewhere..." or "Oh, I always knew my Thorald was alive. Ain't a man in Skyrim who can keep a Gray-Mane down." If asked, she will confirm that she hasn't heard from her sons: "No, nor do I expect to. Would be too dangerous for now. It's enough for me to know that they're out there somewhere, and together again." Ysolda: "Fralia, do you ever deal with the Khajiit at all? I'm sure they would love to trade in your husband's steel." Fralia: "Plenty of people here that need Eorlund's craftsmanship, my dear. We've never had any reason to deal with those caravans of theirs." Fralia: "Lillith - always a pleasure. Just browsing, or were you looking for something particular?" Lillith: "Funny you should ask. I'm in the market for a new locket. Something in polished silver, maybe. Big enough to hold, say, a folded-up letter?" Fralia: "Ahhh, I see. I think I know just what you need. I don't have anything like that here now, but my Eorlund - he can make you one right quick. When I get home, I'll have him start on it right away. Come back to pick it up in, oh... three days?" Lillith: "Perfect, my dear. Absolutely perfect. I'll see you then." Fralia: "Eorlund, dearest, are you hungry? Would you like me to fix you something?" Fralia: "A venison pie, maybe? With a nice cup of mulled mead?" Fralia: "When will you be makin' some more jewelry, love? Some silver lockets and amulets would fetch a nice price at the stand." Fralia: "Wonderful, dear. Thank you." When you ask him for a sword, Eorlund will comment, "A blade! It will be as sharp as Fralia's tongue!" He was also supposed to admit, "My poor Fralia thinks Thorald's still alive, but I know better." However, the condition for this line is incorrectly set to stage 1000 of In My Time Of Need, meaning it cannot be heard. If Avulstein is dead, Thorald was intended to say, "I don't dare return to Whiterun. But my mother... She'll need some consolation. Tell her... tell her to suffer the winter's cold wind, for it bears aloft next summer's seeds. She'll understand." If asked about Thorald after the quest, Fralia was also supposed to reply, 'No, nor do I expect to. Would be too dangerous for now. It's enough for me to know that he's out there somewhere, and not locked up like an animal in a cage." As Avulstein is essential, these lines cannot normally be heard. This page was last modified on 1 June 2018, at 01:00.